Wall Street - Information Desk! Wall Street is a street in Lower Manhattan. It runs east from Broadway to South Street on the East River, through the historical center of the Financial District. It is the first permanent home of the New York Stock Exchange; over time Wall Street became the name of the surrounding geographic neighborhood. Wall Street is also shorthand for the "influential financial interests" of the American financial industry, which is centered in the New York City area. 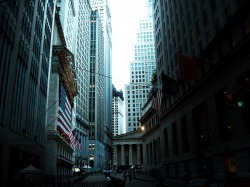 Several major U.S. stock and other exchanges remain headquartered on Wall Street and in the Financial District, including the NYSE, NASDAQ, AMEX, NYMEX, and NYBOT.